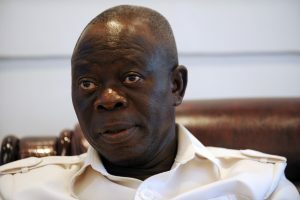 Edo State Governor, Comrade Adams Oshiomhole, yesterday attributed the crisis rocking the Peoples Democratic Party (PDP) to God’s vengeance for the party’s alleged destruction of the country, adding that thieves that brought Nigeria to its kneels were now on the run. The Governor who stated this when he feted Muslims in the state in Government House as part of the Id-el-Fitri celebration, assured the Muslims community that Nigeria would be a great country again with the actions taken by President Muhammadu Buhari, urging the Muslims to thank Allah for making Buhari President. Apparently replying Buhari’s critics, Oshiomhole the President has to be rigid to be able to find the thieves as well as avoiding building on a foundation already destroyed by the PDP, stressing that Nigeria would have become a collapsed state if Jonathan had continued as President. The Governor while explaining that the first step to making the needed change was to fix wrongs done in the past and cleanse rot done by the PDP, said the past administration failed to save to make adequate plan for the country but resorted to careless looting of the national treasury. “We have to thank Allah for making it possible for Buhari to emerge. God so love Nigeria that he brought Buhari at this time. “If Buhari had not come, we will not know why the Nigeria government failed to tackle Boko haram. They are now confessing like witches. A pastor that emerged as candidate confessed to collecting N700m from Fidelity Bank”, Governor Oshiomhole said.